Boil Aqua Panna water in the boiler till it reaches 70 – 80°C. Place Dilmah Meda WatteTea in a tea pot. Add boiling water to the tea pot over the tea. Stir while water is being poured in the tea. Allow tea to brew for at least 5 minutes. Strain the tea to another tea pot and allow cooling. Take a Boston shaker and add basil leaves, sugar syrup and lemon juice to muddle. Add the Dilmah Meda WatteTea (cooled) to muddled mixture. 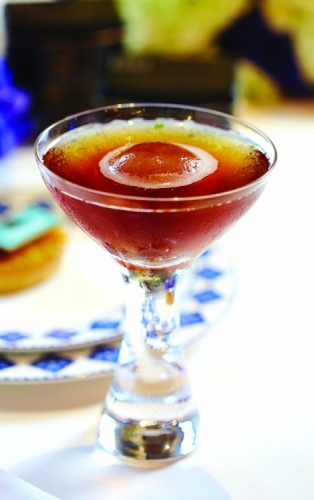 Pour the mocktail into a glass over the round tea ice ball.